I made this one for Alyssa. Those are The Princess and The Monster's real initials. What! You didn't think their names were really The Princess and The Monster, did you? Anyway, I listed this on Etsy for $35, and I made a sale! 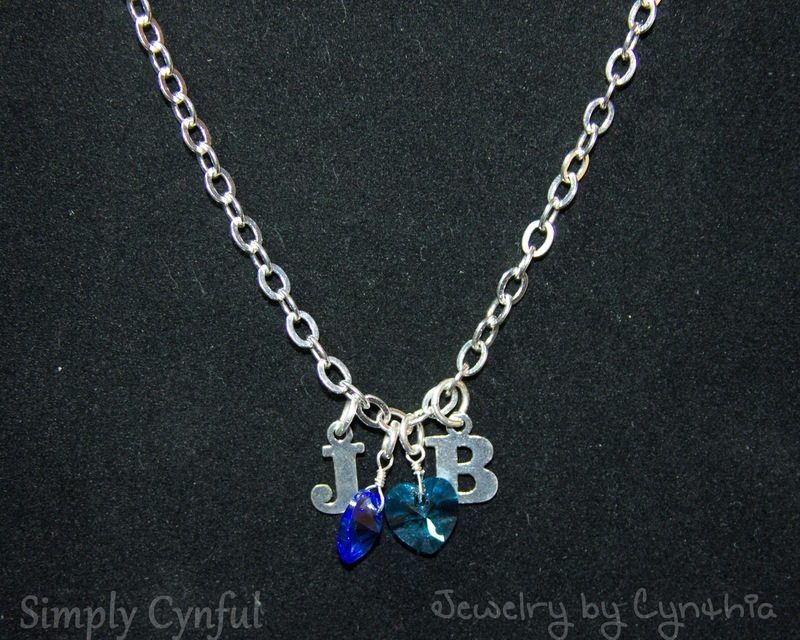 Actually, the buyer wanted one for a customer with only one child, thus only one initial and one birthstone. For that I charged $26. Of course, if someone wanted more instead of less, I'd certainly be willing to come up with an appropriate price. I've got a couple ID bracelets in the works, and I'll share them with you when they're finished. I'm having a lot of fun with this, and if it weren't for NaBloPoMo, I might not have take the time to post tonight. I've got two more posts ready for you tomorrow and Thursday. My final NaBloPoMo post will be Friday. Not sure what that one is yet. Anyway, tomorrow The Hillbilly is stopping by to fulfill my posting duties, and Thursday I'll tell you all about Little Mama and the coffee. It's a great story.